There hasn’t been a Sim’s Life giveaway for a while, as always I know how to pop back up in style! The latest giveaway is going to be perfectly timed with the impending October half term, to keep the little ones entertained and give adults the opportunity to cuddle up on the couch for a break too! Did you know that Robinson Crusoe was first published in 1719? Since then it has become a much loved story with many films being made regarding the Daniel Dafoe novel. To celebrate, Sim’s Life is giving away 3 x merchandise packs that include a colouring book, character masks, a sticker set, activity sheet and Robinson Crusoe on DVD! 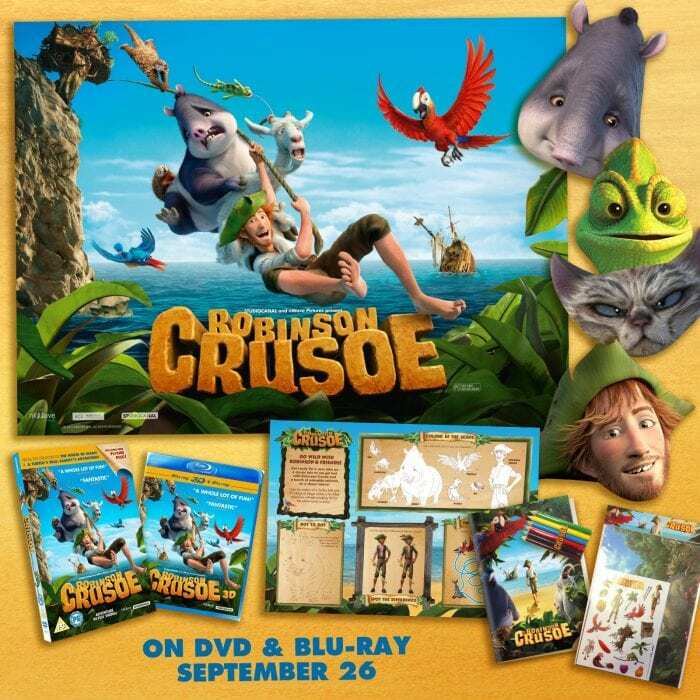 For your chance to win 1 of 3 Robinson Crusoe merchandise packs, simply enter the giveaway using the Gleam form below! Sun cream,water and kiwi fruits. A satellite phone, a desalination device and a guide to the local flora and fauna. Lol …. a female! I’ll send you my mum then!! Bear grylls, Jamie oliver & a yacht ! A mobile phone, a camera and a good book. My phone, a bbq and my hubby! A cuppa coffee, an episode of Eastenders and the Daily mail! A Swiss Army Knife, a dictionary (all the worlds books are in there somewhere) and 1 million tea bags. A tent, a pile of books (am I allowed more than one? if not, then a very long book!!) and a sharp knife for cutting up my prey!! You don’t fancy using leaves then?! A radio, latest edition of Wisden and a knife. A very big book, matches, and a sleeping bag! Not things but people: Bear Grylls so he could look after us, David Attenborough as I am crazy about natural history too, would make our time there far more interesting and my boyfriend of course. My mum and my two daughters. My practical husband, a machete and a well. My phone, a solar charger and a knife! Flares,Swiss army knife, wind up radio? A camera, a swiss army knife and a good book! A machete, a large tarpaulin and a flint. A satellite phone, a cooler full of beer and a good book. a book,teabags and a kettle!! A sudoku book, sun tan lotion and a bottle of vodka!!! My family, a good book and a big stash of chocolate!! A phone, a machete and some fags! A knife, flint and crossbow! family, pets and food/water supplies. A bottle of Gin, Bear Grylls and chocolate! A proper bed. A machete. Large water container. Water, sunscreen and my iPod (with a solar charger). Box set of Harry Potter DVDs, dessert buffet and a bouncy castle! Willie Nelson with his guitar to sing to me, Gordon Ramsay and his kitchen to cook for me and my cats to keep me company. An ereader with unlimited books, a bed and a cat. Bear Grylls, a Bible and a wind up radio. Endless supply of food, water and suncream! Matches, knife, bottle of water. my daughters a knife and a chicken . I would like to be marooned on a desert island with a tent, my favourite book and water purifying tablets! a good book, a big box of sweets and a torch ! Lots of chocolate, tea and books! Foundation, water and a mobile phone!